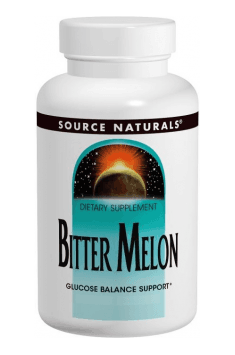 The majority of scientific studies indicate that the most beneficial daily dose of bitter melon, providing the best effects, is the dose of 1-2 g (2-4 capsules). This is an effective dose in supporting the normalization of carbohydrate metabolism. It is best to divide the dose into 2-3 portions and take them after meals to ensure the best possible assimilability. The preparation should be taken for max. 3 months, after which a break should be taken. Bitter melon (Momordica charantia), also known as balsam-pear or bitter squash, is a kind of a plant in the family Cucurbitaceae, coming from tropical terrains. The plant has been used for millenniums in Ayurveda. The material here are fruits, characterized with bitter taste, containing i.a. amino acids, phenolic acid, rutin and polypeptide-p - a protein imitating the activity of insulin, called plant insulin. The activity of bitter melon consists in regulating and supporting the maintenance of the proper glucose concentration in blood by means of a few mechanisms. There are ca. 120 scientific studies confirming hypoglycemic activity of this plant. Moreover, extracts from this plant support digestion and liver work. Bitter melon has normalizing influence on the level of total cholesterol, LDL fraction and triacylglycerols in blood, thanks to which it supports weight loss, maintaining proper body mass and may constitute a valuable element of prophylaxis of cardiovascular system diseases. Preparations based on bitter melon demonstrate antioxidant potential, supporting reduction of inflammations and thanks to immunomodulating properties, they boost the organism’s immunity. Traditionally, this plant was used to support the treatment of diabetes, in gastric ailments, as an anthelminthic agent, in the therapy of cough and other ailments of the respiratory system, infections, ulcers and skin diseases, i.a. psoriasis.